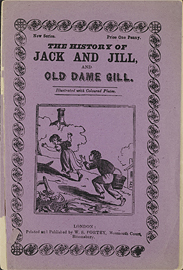 The history of Jack and Jill, and Old Dame Gill. Fortey, W. S. (William Samuel), publisher. First sentence: "Jack and Jill went up the hill, To fetch a pail of water." Date range found in P.A.H. Brown, London Publishers and Printers, p. 68. Copy in McGill Library Rare Books and Special Collections: purple wrappers. text.chapbook.black and white, 21 x 14 cm.